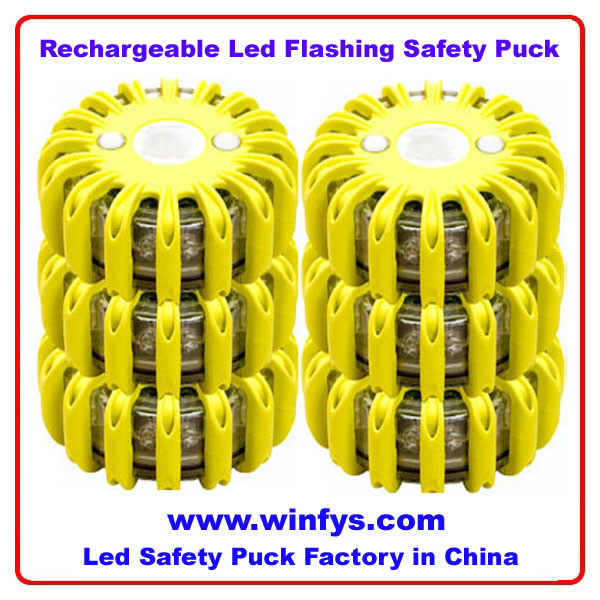 The Rechargeeable Safety Puck work well and are a great safety and emergency light as well as ones to keep around the home for safety and regular use. Rechargeable Led Flashing Safety Puck is the 9-in-1 highly visible LED flare. The Rechargeable Led Flashing Safety Puck is an ingenious safety product that should travel with everyone who drives a motorcycle or car. This compact ultra bright flare will make you and your vehicle visible from a half mile away. The ultra bright led light has 9 different functions and light patterns. Several light patterns are directional so it can be used as a flashlight for roadside repairs and inspections. If you have to stop on the side of the road, just grab the Rechargeable Led Flashing Safety Puck and it attaches to your motorcycle or car in seconds with the heavy duty magnets. On coming traffic will see you better and much better thus greatly increasing safety. Grad one for your motorcycle and each car and you and your family will have the peace of mind of having visibility in the event of a roadside stop. 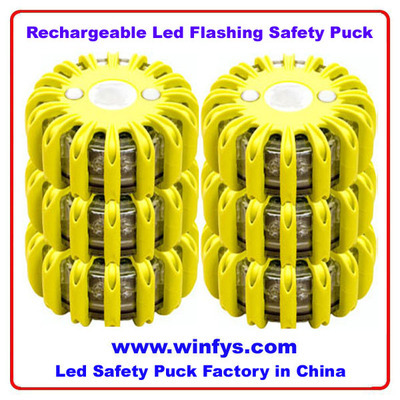 The Safety Puck is a red LED rechargeable light with 9 separate light and flashing combinations for safety and emergency use that recharges easily with the enclosed adapters. The Safety Puck includes the puck light itself, a magnetic base for charging, a car outlet and household plug in with a USB cable for charging. The Safety Puck has the USB cable for plugging the charge base into either the household adapter or the vehicle adapter as well as your computer or other USB powered device.